I have records for him at Ellis Island in 1922 and 1923, but one source says he came to America in 1914. He lived in Cleveland, Ohio and was a professor at the University there. Would it be possible for SKS to look for him on the 1920 and 1930 censuses, and let me know any details there. Another thought, are naturalization records accessable online, and if so, where could I look ? could this be him? this is the only Remenyi living in Ohio 1930 Fed Census... He was a Music Teacher born Hungary Could it be Fred Joseph Remenyi..and he droped the Fred and Used Joseph Instead? Personal Information Census Image What to do next? Everything looks possible except his place of birth which is stated as New York.. Many thanks for the quick reply, but I don't think it is him, he was definitely born in Europe, and almost certainly Hungary. Second thoughts: he's playing games with the census taker ?? The date of birth I have is 1892. Do you have his wife's name anywhere ? It should be Margaret, and they had no children. Joseph Remenyi, age 28, B Hungary, parents born Hungary, to USA 1898, Naturalized in 1915. Newspaper Writer. Could this be your Joseph? Many thanks for the look-up. This source http://www.margulies-chronicles.com/ag/_margulies/img/remejose1892-mem2.jpg says he came to the States in 1914, and my Aunt say, her Uncle came to the States "in the early twenties", and certainly not with parents. They had three other children, who were all in Europe ! I don't know what he was doing in 1920, but in 1929 he was a lecturer at Western Reserve University, Cleveland, ending up as professor. 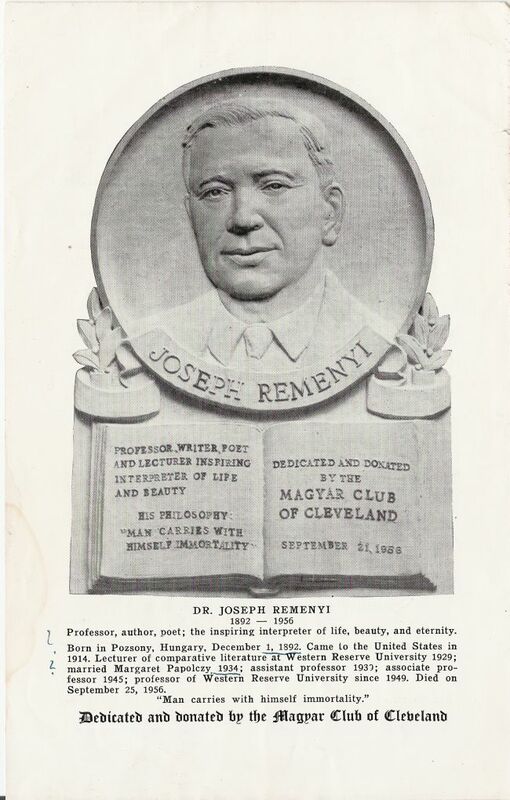 REMENYI, JOSEPH (1 Dec. 1892-25 Sept. 1956) was a widely recognized Hungarian-American writer who served as professor of comparative literature at Western Reserve Univ. (see CASE WESTERN RESERVE UNIVERSITY) for a quarter-century. Born in Pozsony, Hungary, he was educated at Francis Joseph Royal Univ. in Szeged and also studies at the Universities of Budapest and Vienna. He worked for several European newspapers before emigrating to Cleveland in 1914 to become an editorial writer for the Hungarian-language daily, SZABADSAG. In 1918 he married Margaret Papolczy (1892-1975), a Hungarian-born actress who thereupon gave up the stage except for an appearance later that year in a one-act play written by her husband for the CLEVELAND PLAY HOUSE. Entitled 30 Jefferson Arcade, its setting was reminiscent of LAUKHUFF'S BOOKSTORE in the Taylor Arcade. Remenyi also began writing novels about the Hungarian-American immigrant experience, which were published in Hungarian back in Budapest. Some of them, such as Szerelmesek Voitak (They Were in Love), had a Cleveland background. He was hired by RAYMOND MOLEY† in 1922 to conduct social surveys for the CLEVELAND FOUNDATION and also was an immigration consultant for Cleveland Trust (see AMERITRUST). He began teaching in 1929 at WRU's Cleveland College, where his lectures on European writers often earned spontaneous applause from his classes. In 1935 he published an anthology of American authors, Modern American Fiction, in Budapest, while a collection of his own writings, Hungarian Writers and Literature, was published posthumously in this country under the direction of his widow in 1964. He died childless. • Authors, American -- Correspondence. Organized by author. Arranged chronologically within author. Hungarian author, educator, newspaper editor, and professor of comparative literature at Western Reserve University. Letters from 27 well-known literary figures to Remenyi. Correspondents include James Branch Cabell, Willa S. Cather, Waldo Frank, Langston Hughes, Robert Nathan, Allen Tate, and Mark Van Doren. Nice job Valentino !! - that's impressive ! !